The Dancer emerges from a portal in a stained glass window, then drops down and slowly rises with a flaming sword in her hand. This boss has silver plated armor running up and down it's body, with a veil trailing from its head. Her head and neck are covered in a draping cloth, which is held in place by a twisted crown. Hanging from this crown is a metal grate, which hides the Dancer's entire face. It's body is that of a massive, slender woman. The Dancer wields a flaming, curved blade that she uses rapidly as a swinging and thrusting weapon. She has another, similar curved blade, which is coated in ash. When the Dancer is killed, a notification appears saying "Heir of Fire Destroyed", and the player receives the Dancer's Soul. Being an heir of the flame makes her akin to Gwyn. Also, Nashandra's soul has the description "One day the flames will fade, and only darkness will remain. Unless, of course, an heir arrives". So, it seems that the player's mission is to hunt down and extinguish these heirs. The mirage-like aurora veil is said to be an article of the old gods, permitted only for direct descendants of the old royal family. Interestingly, the Dancer's Soul can be transposed into the Soothing Sunlight miracle, granted to the maidens of the Princess of Sunlight. 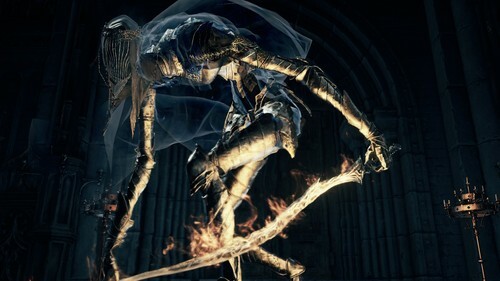 The Dancer is said to be a direct descendant of the old royal family, presumably the royal family of Anor Londo, meaning Gwyn's children. […]The Pontiff Sulyvahn bestowed a double-slashing sword upon a distant daughter of the formal royal family, ordering her to serve first as a dancer, and then as an outrider knight, the equivalent to exile. Special miracle granted to the maidens of the Princess of Sunlight. […]The miracles of Gwynevere, the princess cherished by all, bestow their blessing on a great many warriors. Paired enchanted swords that Pontiff Sulyvahn bestowed upon the Dancer of the Boreal Valley. These blades, symbollic of the Dancer's vows, are enchanted with dark magic in the right hand, and fire in the left, mirroring the Pontiff. […]The mirage-like aurora veil is said to be an article of the old gods, permitted only for direct descendants of the old royal family. 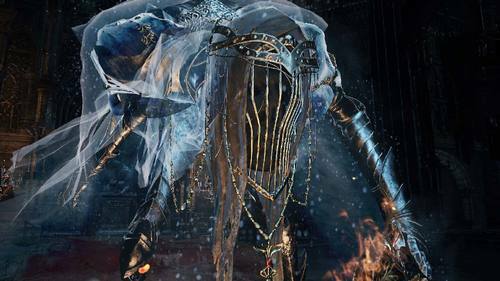 […]The black eyes of the Pontiff eventually transformed the Dancer into a beastly creature, her armor fusing with her own hide. Just a tought, a theory about the Frigid Dancer and Nadalia. Nadalia was burn alive because she didn't find the King in the tower, infact in her soul's description we can find another refer, "In the act of DANCING (death), the Bride of Ash was transfigured as smoke..[..]", also the Dance of Fire's description says again "The fire seems to DANCE, and makes its victims dance with it". Is that a coincidence that the "act of DANCING" is repeated a few times..? We didn't fight against Nadalia in DSII, and in DSIII The Dancer wields a FLAMING (Nadalia was also fire) curved blade with another similar curved blade, but coated in ASH..
Oh, last thing: Nadalia was transfigured by fire, so isn't strange that the Dancer has her face/neck full covered. So, that's all. I'll wait comments, I wanna know your opinions about this little theory I've made. Re: Just a tought, a theory about the Frigid Dancer and Nadalia. I love this theory; there's no denying the symbolic link. It may be nothing more than symbolism repeated between games in the series (like so many other examples, including the core plot point of linking the fire). However, I very much believe in this as a "soul descendant" theory, where souls are recycled just as the world itself is cyclical. Honestly, I think your theory is a far stretch. The Dancer used to be a courtesan to Pontiff pretty much, and she wears what she wears because she is an outrider knight. She wields a flaming and a dark sword because she used to serve Sulyvahn. I dont think a mention of a word in both soul descriptions is evidence enough. You don't think the fact that both items blatantly state that she is a member of the old royal family is evidence enough, but you think she was Sulyvahn's prostitute? Where exactly in the game is there evidence of that?